The two things I'd like to share with you guys today are nail art products from BornPrettyStore. They're always a great place to find nice and inexpensive nail art supplies. The first product is a nail polish made for stamping. It is white and comes in a square bottle that holds 6ml. It retails for $3,99. The consistency of this nail polish is really great. It's quite liquid, but just creamy enough to have the perfect pigmentation. A great choice for nail art! Second up, to go with the nail polish, we have a stamping image plate. It is the number BP-48 and holds 4 designs: a butterfly, detailed flowers and two patterns that they call arabesque. They are very detailed and fun to look at! You can get it online for $2,99. Together, the nail polish and the image plate make the perfect combination. I'm really no expert at stamping, but it worked right away for me. There were no problems with the designs, they are all very crisp and clear. I love how the design turned out on my nails, especially how even though I only used one design, the nails all look individual. 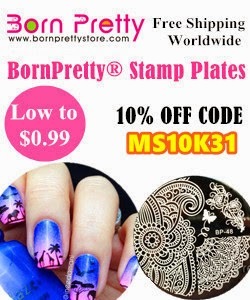 By using the code MS10K31 when checking out, you will get 10% off your order from BornPrettyStore! I'm a huge fan of the products, and am very glad to tell you that I have two more image plates laying around and waiting to be tested! Expect some more stamping nail art coming your way. Have you tried any of these products? And what are your experiences with stamping? Let me know!